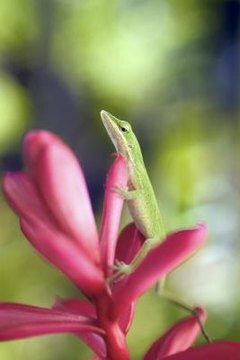 South Florida has almost a dozen species of geckos. Only one of its geckos is native to the state; the other 10 are imports. Most of these lizards are found from the northern edge of Lake Okeechobee to the Florida Keys. Some geckos are longtime residents while others are relatively new arrivals. Florida's only native gecko is the Florida reef gecko. He's a secretive, tiny fellow, about the size of a matchstick. His brown body sports dark spots and is only about 2 inches long, head to tail. You can find this gecko in the Florida Keys and extreme southeastern portion of mainland Florida. He's active at dusk and you may catch him running between ground cover or holes. Tiny spiders and insects are his dinner of choice. The Tokay gecko came to South Florida via Southeast Asia in 1965. He's a large lizard, running up to a foot long. He's popular in the pet trade and is often released by his owners to help control cockroaches. He'll also eat other arboreal frogs and lizards and small rodents and nesting birds. The common house gecko also has been expanding in number since his wild release in 1979. He's common in the pet trade, but is found in the wild mainly in Key West. The Indo Pacific gecko has been in the state for more than 50 years and has the widest distribution through the state of the non-native geckos. Around 5 inches long, the Indo Pacific is an all-female species, which may account for the expansion of her species. Look for her in urban and suburban areas lounging on fences, buildings and bridge abutments; she prefers pine rock lands, mangrove forests and sand pine scrub when she wants to enjoy nature. A couple of "new" arrivals from 1990 have fared well in Florida. The tropical house gecko continues to expand, despite not being at home in his native Africa. Though he reaches only 5 inches in length, it doesn't stop him from noshing on other small geckos and anoles. He's easily frightened, so he tends to stay away from human dwellings, despite the "house" in his name. The bright green Madagascar giant day gecko is indeed larger, running about 11 inches long. He's also been around since 1990 and is expanding in number. A diurnal lizard, you can look for him on building walls and tree trunks, perhaps snacking on insects or sap. Despite his increasing population, he's mostly found in the Florida Keys. The Mediterranean gecko was first introduced in 1910 and his numbers are declining. Maxing out at 5 inches long, his body color will change from dark in the daylight to lighter shades at night. He hangs out on building walls or ceilings at night, looking for insects to feed on as they approach light. The tropical house gecko is replacing him in the lower Florida Keys. In the southern mainland, he's being taken over by the Indo Pacific and tropical house geckos. The ashy gecko turned up in 1921 via Cuba. He used to be common in the lower Keys, but his numbers have dropped, possibly because he's prey for the larger tropical house gecko. The ashy only reaches 2.75 inches in length. The yellowhead gecko, introduced in 1939, is also in decline. He's a shy guy, hanging out under large, low tree limbs or in rock piles. The ocellated gecko came a few years after the yellowhead, likely by accident as a stowaway in a shipment from Jamaica or Cuba. Only reaching 2.5 inches in length, he prefers to hide in ground debris or leaf litter.